Accessories: Accompanied by F.P. Journe Guarantee dated November 19, 2007, product literature, polishing cloth, fitted presentation box and outer packaging. Since its launch in 2000, the Resonance is one of contemporary horology’s most iconic pieces. Inspired by the work of the great 18th century watchmaker Antide Janvier, Journe rose to the challenge in 1983 and created a pocket-watch using the resonance phenomenon and launched a wristwatch 17 years later. It was the world’s first wristwatch to use the resonance phenomenon whereby the movement is composed of two independent balances, alternatively serving as an “exciter” and “resonator”. When in motion, the balances create the resonance effect and beat in opposition, naturally evening out each other’s discrepancies and thus permitting greater accuracy. In addition to being a maverick, the Chronomètre à Resonance is also an extremely useful dual time watch. Featuring a 40 millimeter case and now discontinued, this second generation model is one of the most classic iterations of the Resonance. It is complete with its original certificate and presentation box, further adding to its collectibility. 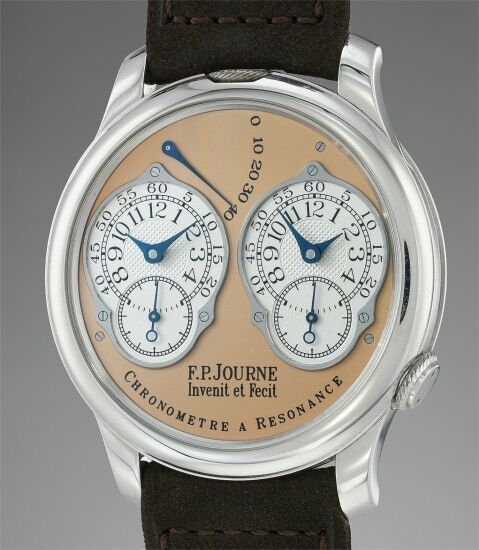 Founded by watchmaker François-Paul Journe in 1999, the F.P. Journe brand is relatively young, but already is as highly regarded by collectors as many distinguished manufacturers with centuries-old heritage. In the minds of the world's savviest collectors, Journe is producing some of the finest wristwatches the market has ever seen. Mastering his craft from restoring historical timepieces, he was the first to create a wristwatch incorporating two escapements that benefit from the phenomenon of resonance — the Chronomètre à Résonance. Key models include the Résonance, tourbillon wristwatches incorporating a remontoir and the limited edition Vagabondage series. Especially sought-after are his earliest "souscription" watches, made in 1999.